_Davide Fontana, a.k.a Gibbo, was born in Piacenza, Italy in 1983. Upon finishing his studies at age 18 as an electrician, he started to get interested in juggling. He soon gave up his career as an electrician and decided to follow his dream and began performing his juggling street show. After gaining a few years of experience and participating in various workshops with masters such as Peter Wayel and Rita Pelusio, Gibbo created his solo show “Top Secret”. He studied theatre at the “Philip Radice’s Atelier Teatro Fisico” in Torino, Italy for 3 years. He then decided to give up the circus life and focus all of his energy on his true vocation: MAKING PEOPLE LAUGH!!! Between 2004 and 2005 he participated in festivals, television programmes and conventions. He collaborated with Sandro Berti (Banda Osiris) on the show “Invasioni Poetiche delle Città”. He performed at “Venice’s Carnival” in Piazza San Marco, he won the competition “Artemisia” from S.Giovanni Marignano City Hall as well as having the opportunity to host the “Police Academy” show at the amusement park Mirabilandia. 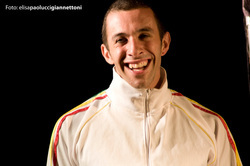 In 2009, he met Stefano Iaboni and created a new physical comedy show called “The Beat Bros.”, which is currently being performed around Europe. _Born in Rome (Italia) en 1977. After spending a few of his younger years travelling around the globe he moved to Holland where he joined a Circus School. Not happy with the weather, the food or the school he took off for Barcelona where he started street performing and gaining experience as a circus artist. 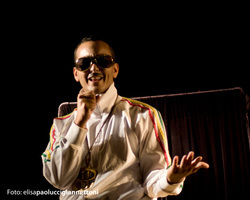 During a festival in Italy he worked with Loco Brusca and once back in Barcelona he joined the “Loco Theatre Laboratory” which made him decide to give up the circus and put all his energy into acting and clowning /performing. He has had the opportunity to work with other great teachers such as Johnny Melville, Christian Atanasiu and, of course, Jango Edwards. As well as working with various theatre companies, he is currently working on projects including “Clowns Without Borders” and shows such as “Johnny and Johnny: The Godfather 4” and “Desperately Seeking Stefano”, both directed by Jango Edwards, and he's also teaching at the Nouveau Clown Institute. From 2009 he’s also member of The Beat Brothers ,a clown street performing duo. He's actually working with his new solo show "The Trumpet".